NEW ORLEANS — The Johns Hopkins women and the North Central (Ill.) men found their way back to the top of the podium this past cross country season. The Blue Jays and Cardinals also took flight in the classroom, which is why the U.S. Track & Field and Cross Country Coaches Association (USTFCCCA) is pleased to name them the NCAA Division III Men’s and Women’s Scholar Teams of the Year for the 2016 cross country season. 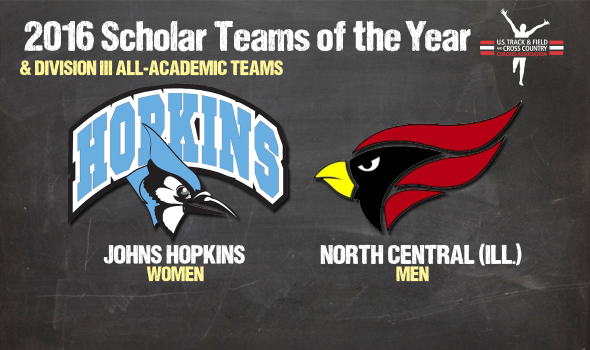 Johns Hopkins and North Central (Ill.) were two of 389 teams that were named All-Academic Teams by the USTFCCCA. Of those 389 teams, 216 were women’s and 173 were men’s. No team had a perfect cumulative GPA, but the top-graded women’s team was from Greenville College (3.84) and the top-ranked men’s team was LeTourneau University (3.80). This is the 4th time in the past 5 years that Johns Hopkins won the NCAA Division III Women’s Scholar Team of the Year Award. It just so happens that the Blue Jays won the NCAA team title each of those seasons as well. Johns Hopkins saw its dreams of a four-peat end last year but got back on the winning side in 2016 with a dominant effort. The Blue Jays only had one runner finish in the top-25, yet scored just 128 points in the process as they packed up well behind Tess Meehan. North Central (Ill.) was on a mission this past cross country season and showed why it turned in one of the most dominant performances in NCAA DIII history. The Cardinals ran roughshod over the competition in Louisville, Kentucky as they scored just 60 points to beat runner-up SUNY Geneseo by a staggering 144 points. North Central (Ill.) put four runners in the top-20, led by Zach Plank (9th). Look below for a full list of teams honored Thursday by the USTFCCCA.